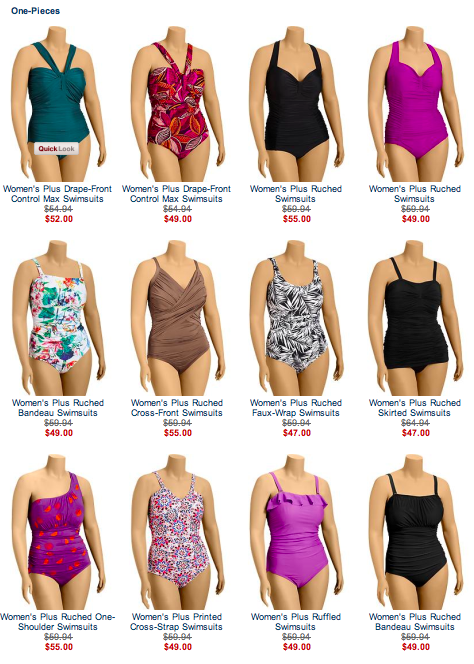 Stylish Curves had a post about Swimsuits For All the other day, and since I am about to take a Water Pilates class I thought I should check it out, and of course I am always interested in whether they have any sizes larger than a size 24. A couple of the models in their cover photo are plus size, which made me very happy. Guess what, those suits in the photos above are their suits that go to a size 34. That is amazing. I would love to hear from any of you who buy one, how fits, whether it is well made, etc. Now of course I think they should have at least one version that does not have shorts or a swim skirt, but that is just me. In fact, I see the size 26 one piece suit above in my future if water pilates works for me and I need a second suit. It is a little pricey at $76, but I am still wearing my last suit from many years ago, although I do not swim that often. Interesting, I just clicked to get additional information and the suit only comes to a 24, and it only offers the size chart to a size 24, so it does not look like the size 26 information is correct. Ooops. Be sure to check out the size chart, it seems to run somewhat small to me… But, I especially like that the site lets me sort by size, since I am not really interested in what they have in a size I cannot fit into. Swimsuit season is on it’s way so let me know what you are loving out there. Here is my Torrid post on the subject, thanks to my FatToo Anonymous friends.